The team at The Law Office of Gary A. Zucker & Associates, P.C. know that accidents can happen anywhere. Whether you are in Manhattan or in Brooklyn, you could potentially be injured when you least expect it, and in those cases, our team will be there to help you hold the negligent party accountable for their actions. Given how much development is occurring in New York City, we wanted to focus on construction accidents that harm workers as well as pedestrians. One kind of accident that can be especially deadly involves something you see all over the place but maybe don't pay attention to most days. When you walk around the city, you'll notice the bustle of people getting where they need to go, great landmarks that make New York a destination for tourists the world over, and scaffolding. Yes, scaffolding is everywhere you look as old buildings get fixed up or new ones get built, and because they are so ubiquitous, it's important that construction companies exercise the utmost caution when erecting scaffolding and when their employees are working on scaffolding. The failure to exercise caution can lead to serious accidents and major injuries. Falls are one of the more common accidents that involve scaffolding in the city. 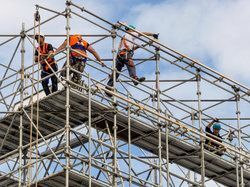 These kinds of scaffolding accidents occur when construction workers slip, trip, or otherwise lose their footing while working on a scaffold, causing them to fall to the ground. Major falls such as these can result in serious injuries to the worker. In addition to the harm to the worker, any pedestrians and passersby may be struck by the falling worker, resulting in severe injuries to both parties. To prevent these accidents, proper fall protection needs to be provided and workplace rules for being on scaffolding closely observed. Sometimes the danger doesn't come in the form of falling workers but falling objects. Tools such as hammers and wrenches, or any types of equipment up on the scaffold, can fall and strike workers and pedestrians on the head. While workers at least have hard hats to prevent major head trauma, your average citizen isn't prepared for these kinds of incidents. Prevention of these accidents generally involves keeping pedestrians away from any hard hat areas and hazardous places near the scaffolding where dropped objects may injure them. Collapsed scaffolding may be the worst possible kind of scaffolding accident that can occur. This means that part or all of a scaffolding gives way and breaks, causing workers atop the scaffolding to fall and the scaffolding itself to topple onto anyone below. You can imagine just how deadly this can be on a crowded city street. To prevent these serious kinds of accidents, it's important that construction companies carefully build scaffolding and make sure that they are sturdily put together so that structural collapses are unlikely. For more information about what to do after a major construction accident, be sure to contact our personal injury attorneys today. At The Law Office of Gary A. Zucker & Associates, P.C. we will be sure to hold all negligent parties accountable for their actions so you can receive just compensation for your injuries.